True to her family and devoted to her faith, Muriel Grace Kroeze leaves behind a legacy of kindness and admirable spirituality. We will miss her warm smiles and thoughtful heart. 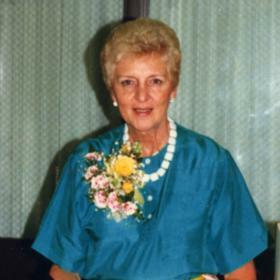 She was a loving wife, a caring mother, and a cherished grandmother and friend. She will never be forgotten. Muriel began her life in 1924. This was a year which made its mark in history with several firsts. The world celebrated the first Winter Olympic games in France. In addition, the United States began the first regular airmail services. Also up in the skies, the U.S. Army celebrated two planes completing the first round-the-world flight in 175 days. On the surface of the Earth, New York City held the first Macy's Thanksgiving Day Parade. Closer to home, in Chicago, Illinois, William Peter and Mary (Bokholdt) Bonnema were about to experience parenthood for the first time in their lives. Muriel Grace was joyfully welcomed on August 23, 1924. She would be their one and only cherished child. Muriel's parents worked hard to provide their daughter a good life. Her father was a janitor in the Chicago Christian School system, and her mother stayed home to keep the home organized and happy. 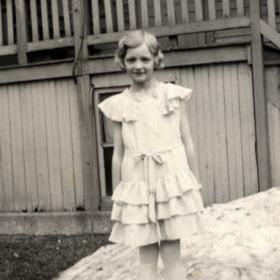 Muriel enjoyed the typical childhood of the time period; she loved playing with her friends, going to the movies, and attending dances. In time, she matured and graduated from high school. Upon earning her diploma, she worked odd jobs before she quickly fell in love. Their story is quite romantic and sweet. Muriel's father met a young man at their church from the Great Lakes Naval Academy, located just north of Chicago. Always warm and welcoming, he invited him to their family home for Sunday dinner. The table was set, and so was their fate. Muriel was introduced to Andrew J. Kroeze, and the two were smitten with one another almost before the first course of the meal. By the end of the dinner, Muriel had fallen hard for the young man in the crisp uniform, and Andrew had been taken by Muriel's beauty. They became a couple immediately and enjoyed a brief amount of dating before Andy was sent to proudly serve his country in WWII. The two corresponded through the mail regularly which gave them a chance to solidify their feelings in writing. Upon his discharge and return to Chicago, the two planned to get married. They rang wedding bells in the summer on July 26, 1946. This commitment in love lasted 62 years sustaining the importance of family throughout the decades for the generations that followed. The newlyweds celebrated their new adventure in life together. Andrew worked in Heating and Cooling for Sears. They became members of Westview Christian Reformed Church where they were active in many aspects of the church community. In time, the happy couple was thrilled to announce that their family was growing. They joyfully welcomed the birth of their first precious child, Billy. They entered this new phase in life with great happiness and love. Sadly, tragedy struck when Billy suffered from a bursting appendix. As a result, he passed away before he turned two years old. This left their hearts heavy with sadness. With the support of their friends and loved ones, they worked on healing their hearts. Never forgetting the place Billy had in their lives, they were blessed again with precious and new life. Soon, they welcomed two daughters, Barbara and Joan. The family of four was complete and filled with gratitude. Andrew and Muriel were determined to give their girls the best of everything. Both girls attended Westside Christian School and Grand Rapids Christian High School. When they were not attending to their studies, the family spent lots of quality time together. Some of this time was spent outdoors, as they camped in many places throughout the country. They also enjoyed less rustic trips to Florida and California among other memorable locations. Muriel and Andrew also enjoyed both Square Dancing and Ball Room Dancing. When the family was home in their usual routines, Muriel was always busy helping to make sure the girls were looked after, the house was tended to, and meals were in the oven. She was a great cook, and she would make mouths water especially for her porcupine meatballs or German potato salad. Her girls could count on some fine articles of clothing fresh off their mother's sewing machine too, as she was a skilled seamstress. 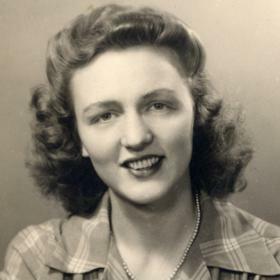 Luckily for her family, Muriel also spent many hours of her life journaling; she leaves behind an amazing and cherished chronicle of her life. As they watched their daughters grow up to find adult lives of their own, Muriel looked forward to becoming a grandmother. 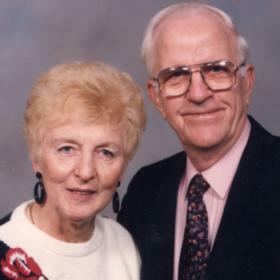 They were given the gift of 3 grandchildren and 2 special great-grandchildren. Each of these young lives created a special place in their grandmother's heart. With their children raised, Andrew and Muriel had a little more time to enjoy with just the two of them again. After Andrew retired, they looked forward to traveling. They created wonderful memories while traveling to Europe, Aruba, Hawaii, and the Caribbean. They also enjoyed many cruises. As they grew wiser in their years, they decided to move to senior housing which proved to be a great decision, for they made many friends. In 2009, just one day after Valentine's Day, Muriel was forced to say goodbye to the love of her life, for Andrew passed away on February 15th. Holding the memories they shared close to her heart, and with the support of her loved ones, Muriel was able to find joy in life again after her heart healed a bit. 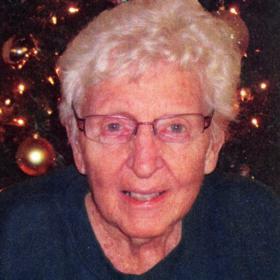 Not long after his passing, she decided to move to Christian Rest Home assisted living and then later the Christian Rest Home where she made many more friends and received loving care from a dedicated staff. Muriel was an enthusiastic member of the Red Hats Club later in her life. She also continued to stay active in her church. If these activities temporarily slowed down, Muriel was just as happy to settle in to watch some 'Jeopardy' or 'Wheel of Fortune' on the television. Sometimes, however, just closing her eyes while listening to Christian music on WYGR proved to be enough, as this helped her reflect on what was most important in her life. Muriel loved her Lord and Savior with all her heart and all her soul. Sadly, Muriel left this lifetime after 93 years. It provides some comfort in our grief to know that she has crossed over to be with her Lord and Savior, to be reunited with her husband Andrew, and precious, son Billy. We will carry the memories we shared with Muriel close to our hearts, and she will be dearly missed.